Before you can add an image, you'll need to upload an image to the image gallery. Next you'll add a module that has an image placeholder. On the Campaigns page, at the bottom of the campaign you want to use, click Edit. In the Image Gallery, find the image you want to add. Click Load more to view more images. Click and drag the image to the image placeholder in the module you added previously. You can resize or change the image. To add more than one image side-by-side, click inside the Image module. Under the 1st image you've added, click the plus (+) sign to add the 2nd image placeholder. Click the plus sign (+) under the 2nd image placholder to add a 3rd image placeholder, and so on. You can add up to 4 images side-by-side. 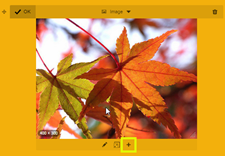 In the Images Gallery, find the image you want to add. 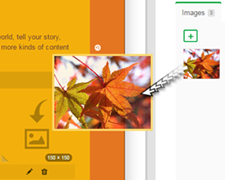 Click and drag each image from the Images Gallery to the image placeholders in the module. After you drag an image to a placeholder, you'll either need to click inside the image or click the pencil button to open Edit mode and add more images.